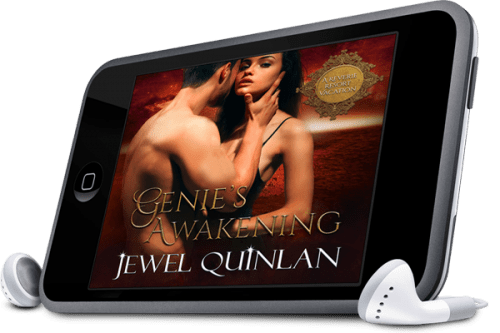 Genevieve, a Jinn, comes to Reverie Resort for one last vacation before she must go before the Afrit tribunal and formally declare that she has no powers. She hopes to enjoy one last taste of a luxury beyond even what she is used to before being cast out of her own dimension to live among humans. As they gawked at her, she stood straight and proud as though daring someone to try and claim her, returning their gazes with scathing, cold eyes, her fair lips pressed into a tight line. After one quick scan of crowd before her, she shot an icy glare at Will, who let go of her and backed off. Colin chuckled. Could this petite thing be the reason for the bruise on Will’s cheek? She radiated anger, was so alive with it that it cast off her like the heat of a flame. “What skills does she have?” asked one of the men. “Yeah, can she work a terminal?” asked another. “A bit scrawny for farm work. Looks like the most she’d be able to do is keep the house clean,” someone else commented. That was followed by snickering from the cluster of men around him. She reminded Colin of warrior princesses in tales. And it was obvious to him that she was unused to being handled the way she was right now. The deep multi-toned chuckle of men followed his statement. But Colin wasn’t among them. Instead, he frowned, and started making his way forward to end the show. The woman stood with her head held high, eyes distant, stance hard as the rock that formed the distant red mountains of Garrulus Four. The men shuffled and murmured amongst themselves. Given the kind of lives they led, beauty was a luxury far outweighed by the many other qualities they needed in a wife. This lot of men were used to leading quiet lives, and they wanted women who did the same or went along with it at least. The woman on the platform would not fit in with this plan. Even if one of them could afford her, Colin doubted they’d be able to handle her. Colin saw one corner of the woman’s mouth quirk upward in satisfaction, and he grinned again. Obviously, she felt like she was winning so far, but what would be the consequences? She’d already stated she wouldn’t work, and she’d failed to declare any skills. If all she had to trade was beauty, she was on the wrong planet. “Eighteen credits then. Who will pay eighteen?” Will called, an edge of desperation in his voice now. “You’ve all become shy suddenly. Suffering from performance anxiety, perhaps? Who wouldn’t be with her around, eh?” He chortled and leered at the woman. Colin could see the men glancing at each other. Who would be crazy enough to take on the beautiful spitfire? That’s what it came down to, their masculinity. Clearly they found themselves lacking, because none of them were brave enough to bid. As the silence stretched on, a warm wind whooshed through, audible in the vacuum of stillness. It was only then that the woman’s stance thawed. Her shoulders rounded, and worry transformed her eyes from their sparkling glare to the round-eyed, lost look of an innocent. The pink lips softened and parted revealing surprise at the group’s rejection, and Colin’s heart went out to her. “Eighteen credits!” His hand shot up in the air before he even realized that the words had left his lips.